Simply complete your pledge card and select the timeframe of your payments. If you choose to make a down payment via check, please make it payable to Legacy of Hope. If you would like to have your payment and pledge payments billed to your credit or debit card, please fill out the corresponding section on the pledge card. We are currently accepting, Visa, MasterCard, Discover, and American Express. Once completed, please return your pledge card by mail in the provided return envelope. The Development Office will send payment reminder statements and a special payment envelope in accordance with the payment plan you have chosen. For those choosing the automatic payment option via credit or debit card, you will not receive reminder statements. Any questions or concerns about using your credit card, please contact the Development Office at (508) 929-4368. Donors may use stock and/or mutual funds to pay their pledge. If the stock has been held long-term (over one year), the donor does not have to pay capital gaines tax on the stock, and is allowed a tax deduction for the average value of the stock on the date received. Donors may also choose to sell stock in order to claim a loss, which may be beneficial for tax circumstances. In either case, the stock must first be transferred to the Diocese before being liquidated. If you would like to initiate a donation of stock or securities, please visit the campaign website or contact your campaign Director to receive a copy of the Letter of Intent. 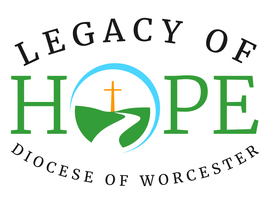 All gifts of stock will be handled by the Diocese of Worcester. Once you have completed the Letter on Intent, please submit it to your broker to initiate the transfer and send a copy of the Letter of Intent to the Development Office at 508-929-4387 fax. Gifts such as life insurance, estate bequests or charitable remainder trusts are welcome. Please contact Michael Gillespie in the Development Office at (508) 929-4368 for more information on types of planned giving to this campaign. Charitable contributions to our campaign are deductible for those who itemize their taxes. Because each situation is unique, we urge you to discuss various gift options with your family and possibly your financial advisors to determine what type of gift is most beneficial and most appropriate for your situation. All case elements in the Legacy of Hope campaign will be funded with the net proceeds from the campaign. All funds contributed to the Legacy of Hope campaign will be used exclusively for the named case elements and expenses. The Diosease is legally and morally obligated to restrict these funds for the stated elements.